You are here: Home / Yoga Articles / Teaching • The Business of Yoga / Teaching Insights / Who are the Best Up-and-Coming Yoga Teachers in New Zealand & Australia? 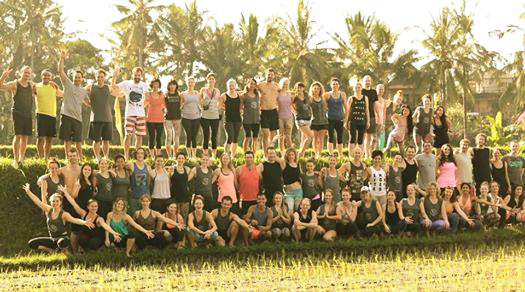 Power Living Teacher Trainees & Retreatees June 2014 in Bali. Is one of them a Best Up-and-Coming Teacher? Nominations now closed. Stay tuned for the winner of a three-day double pass to Wanderlust Sunshine Coast 2016, and the list of successful nominees. We want to identify yoga teachers in Australasia that are flying under the wire. These teachers don’t have a huge presence on social media, they’re not getting booked for festivals, AND they are doing great work. They have a committed yoga practice, they are dedicated to their students, they have an intimate understanding of yoga, and they embody what they are teaching. Yes, we here at The Yoga Lunchbox are going to publish a list of the Ten Best Up-and-Coming Yoga Teachers in New Zealand & Australia. To make that list the most accurate, inspiring and positive, we need your help. We need nominations please. But first, here’s clarity on what we mean by the best up-and-coming yoga teachers in New Zealand and Australia. 1. The teacher must live, or primarily be based in New Zealand or Australia. If they are from somewhere else, they have been living and teaching in New Zealand or Australia for at least a year, and plan to stay there for at least another year. We know – yoga teachers are a global-trotting bunch, and it’s hard to pin any of us down to a particular location. However, we wanted to keep our scope local and small enough so it has some meaning. 2. They are the best teacher you know and practice with. Their classes light you up. They are deeply present and connected, intimately know their stuff, and share it with passion and delight. Best doesn’t mean that they have a high profile, or great publicity. We’re ONLY interested in the quality of the teachings they offer. Which is why we need your nominations – we can’t get around and physically try everyone’s classes! Best doesn’t mean that you like them – it means they’re a great teacher. Nor does it mean you are their best friend – it means they teach beautifully. Quality of teaching – that’s what we’re focusing on. 3. Up-and-Coming means that they are not yet an established big name teacher. They might have been teaching for one year, five years, or even ten years. They might have just written their first book, but no one has really heard of them yet. They might have taught at a smaller festival, but they are not on the line-up for big festivals like Wanderlust. They haven’t yet been featured in magazines, or hit it huge in social media. 4. Yoga Teacher means that they are not just teaching asana, but that they are teaching their students how to witness the fluctuations of their minds. They are teaching their students how to dis-identify with their minds and become more deeply present. Their teaching encompasses not just asana, but also all, or some, of the following: philosophy, meditation, pranayama, chanting, visualisation, and study of texts and/or kriyas. It’s our way of giving something to those teachers flying under the wire and doing amazing work. Plus it lets the yoga community know who those teachers are. We all want to find great teachers! Nominations for the Best Up-and-Coming Yoga Teachers in New Zealand and Australia close on September 25th. The final list will be published in early October. Everyone who nominates a teacher goes in the draw for a three-day double pass to Wanderlust Sunshine Coast 2016. The winner will be announced before the end of September. NOMINATIONS NOW CLOSED. Click the link below for the list of successful nominees. Thank you for helping us find the Best Up-and-Coming Yoga Teachers in New Zealand and Australia! If you filled in the form above, you’re now in the draw for a three-day double pass to Wanderlust Sunshine Coast 2016. And yeah, we know this is subjective, and that we have to believe your nominations, but we will cross-reference wherever we can. Teachers with multiple nominations are more likely to make the list, however it only takes one nomination for a teacher to get our attention. We’ll also be doing our own research, watching the Facebook conversations around this, and talking to our sources across NZ and Australia. The final article will include a list of the Top Ten (likely ten… maybe more, maybe less…)Best Up-and-Coming Yoga Teachers in New Zealand and Australia. We’ll include the teacher’s name, image, a blurb about them, a quote from the nominator as to why this teacher is worth watching, and a quote from the teacher on what yoga means to them, plus links to their website and social media. Hi there, tried to leave a nomination but there isn’t a link & the survey monkey box only takes you to survey monkey to set up a free account. I have 2 teachers I would like to nominate so would love to participate. Cheers! I would comfortably assume many teachers that are under the radar would prefer to stay that way. They have no desire or need for recognition of praise. That is simply an uninvited ego trip. To be nominated and recognised would be against their held beliefs. This is why we’ll be asking their permission to be featured. It’s not about recognition as such, but about honouring those teaches who are embodying and living their yoga. I wish to nominate Rebal Tucker from Lake Cathie NSW. Rebal is able to explain in every day language all the moves and why they are important to the human body. I am sorry that I missed the opportunity to nominate Rebel Tucker of Lake Cathie NSW. She teaches yoga at our over-50’s resort, and is a valuable part of our community. Her gentle, grounded approach to yoga, healing and the body means that we always walk away from a class with uplifted energy, a more comfortable body and a more serene mind. She is a diligent student of the ancient spiritual texts as well as keeping abreast of all the latest sciences. She is a repository of knowledge about the body, and always finishes our class with a blessing in which the healing energy is palpable.